For several generations, the Todd family has shared its passion for creating inspiring landscapes and promoting the health and beauty of trees and shrubs. Peters Tree Service, a full-service tree care company started in 1922, eventually became Peters Todd’s and sparked the founding of a family-owned, high-end landscape design and build contracting firm, Statile & Todd. With Statile & Todd founder John Todd moving toward retirement and his son, Michael, continuing the family’s generational legacy, Statile & Todd sought to rebrand itself while upholding the company’s longstanding reputation for excellence and client service. Statile & Todd had hired Crearé Web Solutions in 2012 to optimize its website, post blogs, manage email lists, and other tasks. As the company began thinking more seriously about a rebrand and new name, the firm needed to redesign its website (launch a website for Peters Todd’s) and create supplementary marketing materials. Throughout 2015, Crearé worked with the company’s leadership team to develop a new brand identity and launch plan. Statile & Todd became The Todd Group and Crearé developed a new website (www.thetoddgroupinc.com), re-introducing the firm in January 2016. We rolled out the new brand to clients through an email campaign in which we slowly unveiled sections of the new logo, revealing the full logo as we shared the new website. 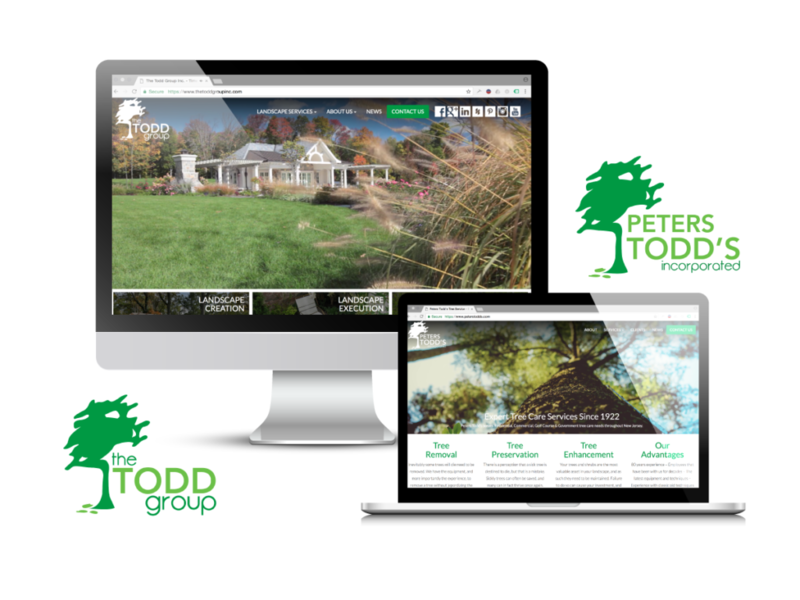 At the same time as The Todd Group’s rebrand, Peters Todd’s (The Todd Group’s sister residential and commercial tree care business) introduced a new, brand-cohesive website at www.peterstodds.com. The Todd Group’s new website captures the firm’s talent for creating awe-inspiring landscapes and estates, discloses details about projects and solutions provided to a wide range of clients, shares homeowner testimonials, and more. Video and photos highlight the firm’s expertise visually, while blog content and project updates offer the specifics of The Todd Group’s competencies that discerning homeowners seek. Today we continue to assist the company in sending regular marketing emails to prospective and current clients, as well as update the blog, and take photography of new installation projects as well as projects that are managed by The Todd Group estate management team. We’ve been partnering with Crearé for our web and marketing needs since their early years. It’s fun knowing that we’re helping a new venture get established while they’re helping a 45 year old business stay current. Brianna and Nic are fun and refreshing to work with and can’t wait to see what else we create.